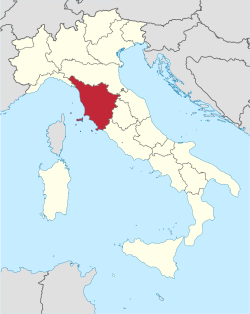 Tuscany (Italian: Toscana, pronounced [tosˈkaːna]) is a region in Italy. It haes an aurie o aboot 23,000 square kilometres (8,900 sq mi) an a population o aboot 3.75 million indwallers. The regional caipital is Florence (Firenze). Tuscany is kent for its gorgeous landscapes, its rich airtistic legacy an its vast influence on heich cultur. Tuscany is widely regardit as the true birthplace o the Italian Renaissance, an haes been hame tae some o the maist influential fowk in the history o airts an science, sic as Petrarch, Dante, Botticelli, Michelangelo, Niccolo Machiavelli, Leonardo da Vinci, Galileo Galilei, Amerigo Vespucci, Luca Pacioli an Puccini. Due tae this, the region haes several museums (sic as the Uffizi, the Pitti Palace an the Chianciano Museum o Airt). Tuscany haes a unique culinary tradeetion, an is famous for its wines (maist famous o which are Chianti, Vino Nobile di Montepulciano, Morellino di Scansano an Brunello di Montalcino). Sax Tuscan localities hae been designatit Warld Heritage Steids: the historic centre o Florence (1982), the historical centre o Siena (1995), the square o the Cathedral o Pisa (1987), the historical centre o San Gimignano (1990), the historical centre o Pienza (1996) an the Val d'Orcia (2004). Furthermair, Tuscany haes ower 120 protectit natur reserves. This maks Tuscany an its caipital ceety Florence vera popular tourist destinations, attractin millions o tourists ivery year. Florence itsel receives an average o 10 million tourists a year, placin the ceety as ane o the maist visitit in the warld (in 2007, the ceety became the warld's 46t maist visitit ceety, wi ower 1.715 million arrivals). ↑ Caroline Bremner (11 Oct 2007). "Top 150 City Destinations: London Leads the Way". Euromonitor International. Retrieved 10 March 2010.